< Back to Part 1. In my article Revising the roots of the family tree I investigated the ancestry of my 8x great grandparents John Atcherley [ ] and his wife Elizabeth (née Elsmere) [ ]. In this article however I will be looking at John and Elizabeth as potential parents of Richard Atcherley [ ] and ancestors of the line of Atcherleys who inhabited Edgerley in Shropshire. If John Atcherley was indeed Richard’s father, then these two men had something else in common besides their biological connection: I have not been able to find a baptism record for either of them! In John’s case I found good evidence (in the form of a will) to show that his father was Roger Atcherley. But why do I think that John, in turn, was the father of Richard? “John Sonne of John Atcherley” [ ], baptised 9 March 1685/6 at Shrewsbury St Mary (pictured left in the late 1700s). “John Son of John Atcherley of Roden & Elizabeth his wife” was buried at High Ercall, in the parish of Ercall Magna, on 28 December 1706. “Mary the daughtr of Jn Atcherley of Edgerley […] borne July 22d”, baptised 6 August 1697 at Kinnerley. Mary [ ] was of Edgerley when she died; she was buried at Kinnerley on 27 December 1772. “Elisabetha filia Johannis Atcherley de Roden et Elizabetha uxoris” [Elizabeth [ ] daughter of John Atcherley of Roden and Elizabeth his wife], baptised 7 February 1700/1 at High Ercall, and buried there the next day. As you will see, records besides baptisms link some of these children as family members. For now though, notice the big gap (seven years) between the baptisms of Roger in 1690 and Mary in 1697 – a gap during which at least one other child may have been born to John and Elizabeth (see the postscript below for more on this). So, after starting their married life at Newton (then a township situated in the countryside outside of the town of Shrewsbury, but within the parish of Shrewsbury St Mary), John and Elizabeth had moved to Edgerley by 1697, and then to Roden by 1700. It appears that they remained there for some time. They were still at Roden in 1706 when their firstborn, John Atcherley junior, was buried. And in 1714, when “A True Copy of the Poll for the County of Salop” was published, John Atcherley’s place of abode was given as “Rhoden” (as was his son Samuel’s). The same publication also noted the place where John held the freehold land which qualified him to vote: “Edgerly”. Elizabeth, who made Mary her executrix, went on to say: “She my sd Executrix within twenty days after she shall receive any profits from this my Legacy paying unto my Son Roger Acherley her Brother the Sum of Ten Pounds which I do hereby give & bequeath unto my Son Roger Acherley aforesd.” Quite apart from confirming the residence of John and Elizabeth Atcherley in 1721, and Elizabeth’s connections to the Elsmere family, this will also confirms Roger Atcherley and Mary as brother and sister. Notice there is no mention of Richard Atcherley, Elizabeth’s son according to my theory. However, there was no mention of her son Samuel either. Elizabeth’s will was witnessed by “Richd Acherley”, “Thos Acherley” and “Mary Acherley”. When I first obtained a copy of this will, I thought that the Richard Acherley who witnessed it must have been Elizabeth’s son, and that fellow witness Mary Atcherley her daughter. But if that was the case who was the third witness, Thomas Acherley? I now believe that Richard, Thomas and Mary were in fact the Rev Richard Atcherley (see Till he grew disordered in his mind) and his parents Thomas and Mary (see Atcherleys Reunited) who, after living for many years at Wrexham, took up residence at Wolverley in the parish of Wem before their final move to the parish of Ellesmere. Much to my frustration, it does not appear Elizabeth’s husband John Atcherley made a will. He may well have made other arrangements for the transfer of his property to his children during his lifetime. But it does not appear that sons Roger or Samuel acquired John’s land at Edgerley in Kinnerley parish. Did he sell it to someone outside of the family? Or did he gift it to Richard Atcherley (his youngest son according to my theory)? John Atcherley was laid to rest on 29 July 1727 – at Kinnerley. The parish register records the burial of “Mr. John Atcherley de Edgerley”. He predeceased his wife Elizabeth, but she survived him by less than three months. On 21 October 1727 an entry was made in the same parish register in respect of the interment of “Mrs. Eliza: Atcherley Wid: de Edgerley”. Afterwards a “true and perfect Invintory” of the money, goods and chattels of “Eliz: Acherley of Edgerley in the parish of Kynerley Deceasd” was made on 25 Oct 1727. It lists “one Bed & bedstid & all things belonging to it”, valued at £4; four pair of sheets valued at £2; “two table Cloaths” and “1 doz. of napkins” valued at £1 and 10 shillings; four silver spoons valued at £2; a “Close Stoole” valued at 5 shillings; and “Wearing Apparill” valued at £5; total value £14 and 15 shillings. When the will of John and Elizabeth’s daughter-in-law Elizabeth Atcherley (wife of Samuel) was written in 1728, one of her two executors was Mr Richard Atcherley of ‘Sowbach’. She does not refer to him as her brother-in-law, but this does not necessarily mean that he wasn’t. Mary Atcherley, her niece (though not identified as such in the will), signed as a witness. Samuel Atcherley’s will was written on 7 August 1731, his sole executor was his “Dearly Beloved Brother” Roger. Roger Atcherley in turn, when his will was written in 1755, mentioned his “loving Sister Mary Atcherly Spinster”. So Samuel, Roger and Mary Atcherley are all firmly linked as siblings. Richard never got the same recognition, at least not in the records I have found so far. All this leaves a less than conclusive case for Richard Atcherley being the brother of Samuel, Roger and Mary (and son of John and Elizabeth). John Atcherley owned land at Edgerley, his daughter Mary was born there, and he and his wife both ended their days there. Richard Atcherley of Edgerley was of Stanton (on Hine Heath) parish when he wed Jane Davies in 1731, the same parish in which Samuel Atcherley and his wife Elizabeth had been living (at Sowbath) prior to their deaths in 1731 and 1728 respectively. Richard Atcherley was an executor of (his sister-in-law?) Elizabeth’s will, and Mary Atcherley was a witness. The same Mary Atcherley remained a spinster until at least 1755 and almost certainly until her death in 1772 – at which time she was “of Edgerley”. As you can see, there are lot of connections in Kinnerley parish in particular which could link Richard with the family of John and Elizabeth Atcherley – and maybe there’s one more. Richard Atcherley did not remarry after the death of his wife Jane, despite having two small children to bring up. Did Mary Atcherley live with Richard and help him raise his children – her niece and nephew? I suspect that she did. The evidence is nowhere near as strong as I’d like, but until something comes along to change my mind my theory remains that the Atcherleys of Kinnerley parish began with Richard – along with his sister Mary and their parents John and Elizabeth. After I wrote this article, but before I put it online, Findmypast added more records (with images) to their record set Staffordshire, Dioceses [sic] of Lichfield & Coventry marriage allegations and bonds, 1636-1893. The Diocese of Lichfield and Coventry includes most of northern Shropshire, and amongst the additional bonds were many relating to Atcherley marriages – including one for Richard Atcherley and Jane Davies. This bond, from 1731, gave exact ages for both the bride and groom. Jane was 21, and Richard’s age appears to have been first written as 37, with the 7 then being overwritten with a 6. Jane Davies was baptised on 31 May 1771 and so was at least 20 when she married; it is entirely possible that she was born several months before her baptism and was therefore 21 years old when she wed. As for Richard, this is the first evidence I have found giving his age at a given point in time (and therefore also an indication of when he was born). In the online Atcherley family trees on this website I have previously suggested that Richard was “Probably born around 1693 in Shropshire”. I chose this date on the basis that it fell roughly mid way between the baptisms for John and Elizabeth’s children Roger and Mary (see my note above). Richard’s marriage bond now indicates that he was born around 1695, so I wasn’t far out in my reckoning. There’s still no direct proof that Richard was also a child of John and Elizabeth, but the new evidence has not disproved my theory that he was! Picture credits. 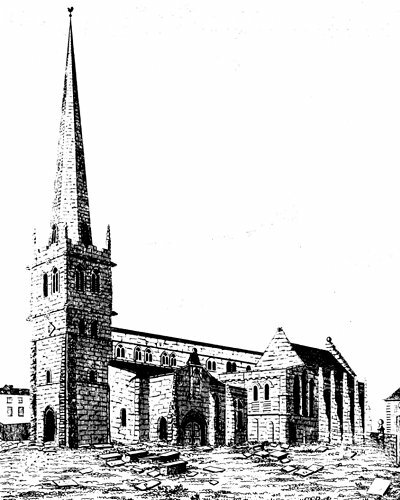 Shrewsbury St Mary: from The History and Antiquities of Shrewsbury, 2nd edition, volume I, published 1837 and therefore out of copyright. Will of Elizabeth Acherley: Embedded with code provided for the purpose by the National Library of Wales website. Shrewsbury St Mary, Shropshire, parish register covering 1685/6. Entry dated 9 Mar 1685/6 for baptism of John Atcherley. Copy viewed at Findmypast – Shropshire Baptisms. Abstract in Shropshire Parish Register Society (1911), Shropshire Parish Registers, Diocese of Lichfield, Volume XII, page 181; copies viewed at Internet Archive and Mel Lockie’s website. Indexed at FamilySearch, Batch P00681-1, Film 908234. High Ercall, Shropshire, parish register covering 1706. Entry dated 28 Dec 1706 for burial of John Atcherley. Copy viewed at Findmypast – Shropshire Burials. Shrewsbury St Mary, Shropshire, parish register covering 1687. Entry for baptism of Samuel Atcherley on 2 Sep 1687. Copy viewed at Findmypast – Shropshire Baptisms. Abstract in Shropshire Parish Register Society (1911), Shropshire Parish Registers, Diocese of Lichfield, Volume XII, page 186; copies viewed at Internet Archive and Mel Lockie’s website. Indexed at FamilySearch, Batch P00681-1, Film 908234. Shrewsbury St Mary, Shropshire, parish register covering 1690. Entry dated 26 Aug 1690 for baptism of Roger Atcherley. Copy viewed at Findmypast – Shropshire Baptisms. Abstract in Shropshire Parish Register Society (1911), Shropshire Parish Registers, Diocese of Lichfield, Volume XII, page 194; copies viewed at Internet Archive and Mel Lockie’s website. Indexed at FamilySearch, Batch P00681-1, Film 908234. Kinnerley, Shropshire, parish register covering 1697. Entry dated 6 Aug 1697 for baptism of Mary Atcherley. Copy viewed at Findmypast – Shropshire Baptisms. Abstract in Shropshire Parish Register Society (1913), Shropshire Parish Registers, Diocese of St Asaph, Volume III, Kinnerley, page 49; copies viewed at Internet Archive and Mel Lockie’s website. Indexed at FamilySearch, Batch P01544-1, Film 908230. Kinnerley, Shropshire, parish register covering 1772. Entry dated 6 Aug 1697 for burial of Mary Atcherley. Copy viewed at Findmypast – Shropshire Burials. Abstract in Shropshire Parish Register Society (1913), Shropshire Parish Registers, Diocese of St Asaph, Volume III, Kinnerley, page 49; copies viewed at Internet Archive and Mel Lockie’s website. High Ercall, Shropshire, parish register covering 1700/01. Entry dated 7/8 Feb 1700/01 for baptism and burial of Elisabetha Atcherley. Copy viewed at Findmypast – Shropshire Baptisms / Shropshire Burials. William Taylor (1714), A True Copy of the Poll for the County of Salop, page 9. Copy viewed at Ancestry – UK, Poll Books and Electoral Registers, 1538-1893. Llyfrgell Genedlaethol Cymru – The National Library of Wales. Elizabeth Acherley: will, 1728 (SA/1728/74). Copy viewed at National Library of Wales website. Kinnerley, Shropshire, parish register covering 1727. Entry dated 29 Jul 1727 for burial of John Atcherley. Copy viewed at Findmypast – Shropshire Burials. Abstract in Shropshire Parish Register Society (1913), Shropshire Parish Registers, Diocese of St Asaph, Volume III, Kinnerley, page 115; copies viewed at Internet Archive and Mel Lockie’s website. Kinnerley, Shropshire, parish register covering 1727. Entry dated 21 Oct 1727 for burial of Eliza: Atcherley. Copy viewed at Findmypast – Shropshire Burials. Abstract in Shropshire Parish Register Society (1913), Shropshire Parish Registers, Diocese of St Asaph, Volume III, Kinnerley, page 116; copies viewed at Internet Archive and Mel Lockie’s website. Staffordshire and Stoke on Trent Archive Service: Will of Elizabeth Acherley / Atcharley of Sowbatch. Proved 30 Apr 1730. Copy from Lichfield Record Office, reference B/C/11. Indexed (as Elizabeth Atcherley of Lawbatch) at Staffordshire Name Indexes. Also viewed at Findmypast – Staffordshire, Dioceses [sic] of Lichfield and Coventry wills and probate 1521-1860. Staffordshire and Stoke on Trent Archive Service. Will of Samuel Atcherley of Sowbath, Gent. Proved 28 Apr 1732. Copy obtained from Lichfield Record Office, reference B/C/11. Indexed at Staffordshire Name Indexes. Also viewed at Findmypast – Staffordshire, Dioceses [sic] of Lichfield and Coventry wills and probate 1521-1860. Staffordshire and Stoke on Trent Archive Service. Will of Roger Atcherly of Frankwell, tanner. Proved 22 Oct 1756. Copy viewed at Findmypast – Staffordshire, Dioceses [sic] of Lichfield and Coventry wills and probate 1521-1860. Staffordshire and Stoke on Trent Archive Service. Marriage Bond of Richard Acherley dated 16 Oct 1731. Copy viewed at Findmypast – Staffordshire, Dioceses [sic] of Lichfield & Coventry marriage allegations and bonds, 1636-1893.